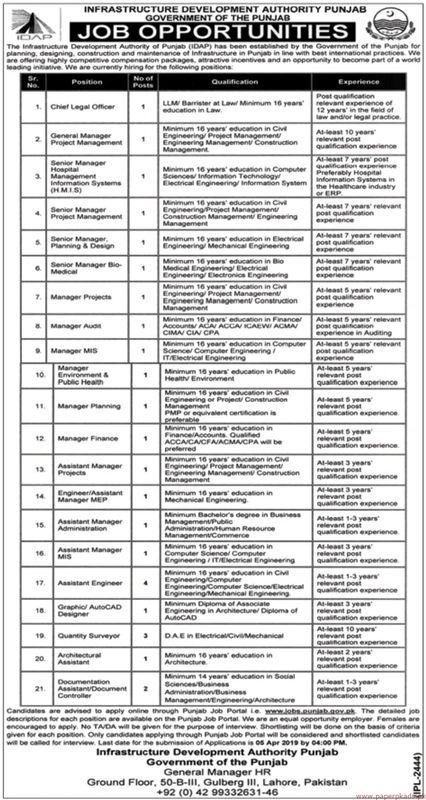 Infrastructure Development Authority Punjab Jobs 2019 Latest Offers Vacancies for the Positions of Chief Legal Officer, General anager, Senior Manager Hospital Management Information Systems, Senior Manager Planning & Design, Senior Manager Bio Medical, Manager Projects, Manager Audit, Manager MIS, Manager Environment & public Health, Manager Planning, Manager Finance, Assistant Manager Projects, Engineer, Assistant Manager MEP, Assistant Manager Administration, Assistant Manager MIS, Assistant Engineer, Graphic Designer, Quantity Surveyor, Architectural Assistant, Documentation Assistant, Document Controller. These posts are to be based PUNJAB Lahore. The aforesaid Jobs are published in The Nation Newspaper. Last Date to Apply is April 5, 2019. More Details About Chief Legal Officer, General anager, Senior Manager Hospital Management Information Systems, Senior Manager Planning & Design, Senior Manager Bio Medical, Manager Projects, Manager Audit, Manager MIS, Manager Environment & public Health, Manager Planning, Manager Finance, Assistant Manager Projects, Engineer, Assistant Manager MEP, Assistant Manager Administration, Assistant Manager MIS, Assistant Engineer, Graphic Designer, Quantity Surveyor, Architectural Assistant, Documentation Assistant, Document Controller See job notification for relevant experience, qualification and age limit information.